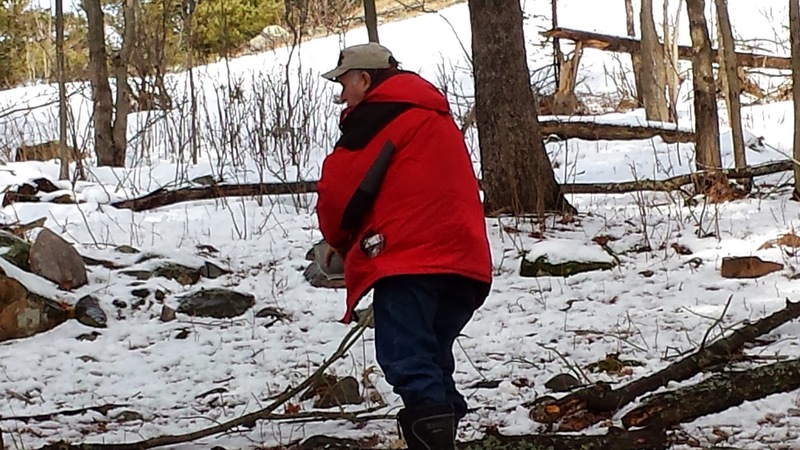 Living Life by Design - with Alan and Mark: Observing Animal Behaviour - Up, Close and Personal! Observing Animal Behaviour - Up, Close and Personal! On the way back from Sault Ste. Marie this afternoon, we stopped at a favourite place of ours on the outskirts of Iron Bridge where we have seen so many deer over the winter. 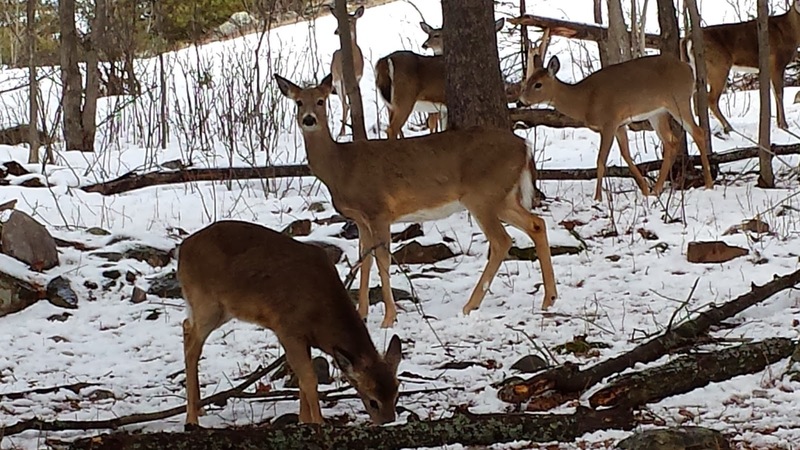 In town, there are a couple of homes that have feeding stations in their yards and the deer flock there in herds. Just on the eastern edge of the town, there is a rock which is known by locals to be the gathering place of one of the local herds. Today, we counted 15 of these creatures and decided that, as this was probably going to be the last time we see them until next winter, it was about time we got up, close and personal with them. Mark had brought along some oatmeal and almonds in the hopes of coaxing them to feed from his hands (or from a plastic bowl that he also brought along). Parking the car on the roadside, we ventured into the bush to where they were, approaching slowly and cautiously so as not to frighten them off. There were a couple of tree-stumps for us to sit on, so we placed the bowl about 10 ft away from where we were ensconced. A few of them ventured close, but kept wary eyes upon us. After about 15 minutes of sitting in stillness and silence, I slowly moved towards the bowl and moved it about 15 ft. from where we were, thinking that by increasing the distance from where we were to where the bowl was now placed, it might entice them by widening their proximity to us. I then returned to my forest seat, and waited. After what seemed an eternity, one of the deer ventured ever so tentatively towards the bowl and finally put his (her?) nose inside, promptly removing it and walking away from it. We thought that perhaps it was put off by the human scent that had been embedded within the plastic. Mark suggested that I should empty the contents from the bowl onto the forest floor. So, once again, I guardedly moved towards the bowl, picked it up, and showed the interested animals the contents of the bowl by letting some of the oats fall from my fingers back into the bowl. Some of the deer moved further away when I started to edge towards the bowl; but there were about three of them that stood their ground, looking on with interest to see what I was doing. I poured the contents into the spot where the bowl had been, and then took the plastic container back to my stump and waited. Sure enough, after a few minutes, one of the deer delicately tiptoed near to the oats and started to feed from them. Once this had occurred, a few more came forth, all within 15 feet of us. It was quite a magical moment. It would seem that, once one of the creatures started to feed, the others gave themselves permission to overcome their timidity and approach the food - though there was one who wanted to hog it all, and kept the others from their share. While observing this, we noticed a couple of interesting behaviours. One fairly small member of the herd, came quite close to us, looked directly at us and several times lifted its leg and stomped it on the ground. We watched it do this a number of times - mostly with its right leg, but sometimes with the left. It was as if it was trying to tell us to get lost and leave them free to devour the gift that we had left. A little later, a larger deer exhibited the same behaviour, all the while keeping his (her) eyes upon us. Click Here to See Deer Stomping. Another fascinating behaviour we witnessed was the sound, reminiscent of a snort, or sneeze, would emit from one of the deer, which we took to be a warning to the others not to get too close. A few times after this happened, the whole herd took off, usually in the same direction, leaving only one or two brave animals that stayed fairly close to us - never letting us out of sight. (You can hear the snort, very briefly at 0:16 in the movie above). Each time this warning was issued, we stayed completely still, and after about five minutes, the others slowly returned to where they had been before. Mark told me that he had brought all the oatmeal and almonds we had and that they were back in the car. 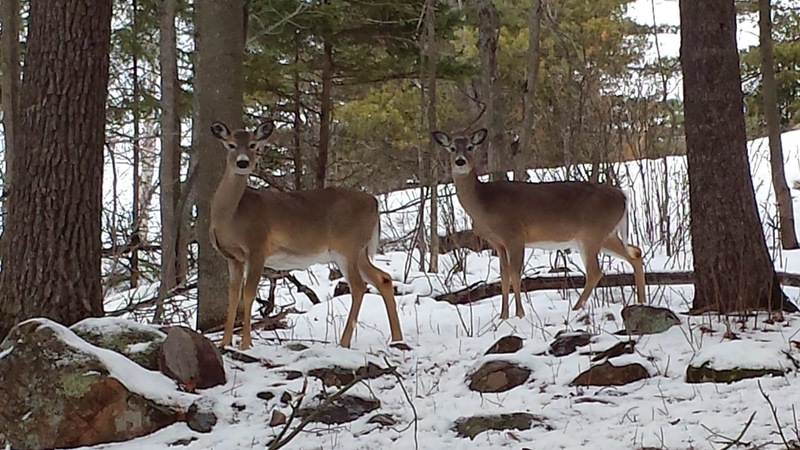 I went to collect them and the deer were all in the same place and did not move until I started to move towards them. A few galloped away, but most of them stayed quite close. In the interests of fair play and equality for all deer, I poured out five piles, making sure that they could all see what I was doing, once again retreating to my observation place to wait patiently and see what they would do. Sure enough, a few of them came to three of the piles and starting to eat, while keeping a careful watch in our direction. 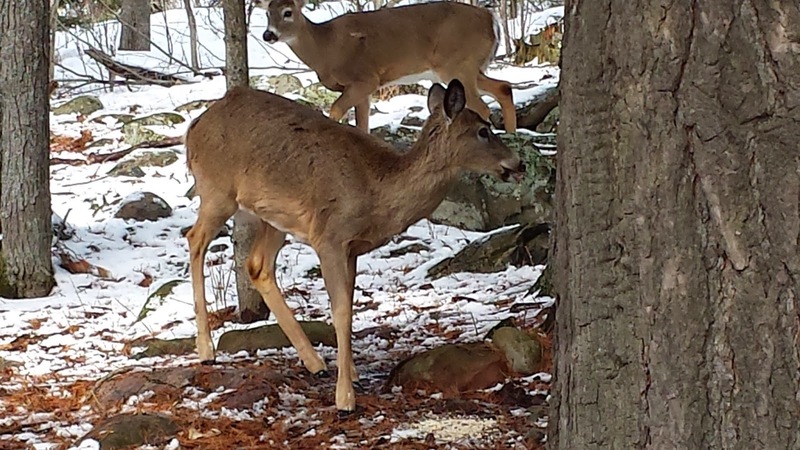 Although one of the others gave the warning signal, two of the deer ignored it and continued to munch away. For about an hour we interacted with them in this way - and Mark was in his seventh heaven to be sure! We decided to leave them and return to the car, feeling a sense of awe at how close they had let us come among them. As soon as we were back at the car, all of the deer moved in on all of the five piles, obviously relieved that we had departed to leave them to their meal. It was truly a spellbinding and spiritual experience - one that we won't forget for a very long time.